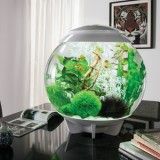 The biOrb fish tank is one of the most popular aquariums throughout the world. Over a million have been sold in the last few years alone. 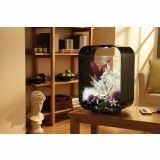 Since the original biorb was created eight more Biorb aquariums have been created, including the Baby Biorb, Biube & Biorb Life Aquariums. 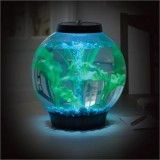 The Biorb Aquariums vary in size from four to sixteen gallons and can be used with both fresh and saltwater. 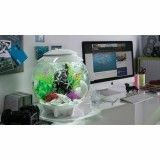 Biorb tanks are great for small desks or larger setups and are easy to clean and take care of for new fish keepers or experienced aquarists. 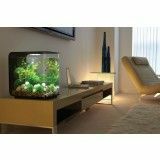 Biorb uses a unique filtration system to keep your tank cleaner for longer. 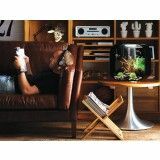 Air driven filtration system creates vigorous water flow and a constantly changing water surface. This maintains oxygen saturation. The circular flow of water then collects any fish waste on its way down. 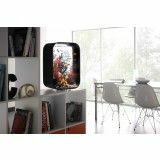 It draws the waste through the ceramic media where the natural biological filtration absorbs some toxins. The freshly oxygenated water also feeds the bacteria. Any remaining waste is trapped in the sponge cartridge. 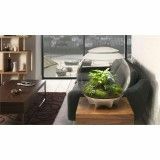 The water then passes through resin particles and natural stabilisers to remove toxic substances and keep the pH levels ­­­constant.